If you use apps to run your business, which I’m sure you do, you’d agree that connecting apps and tools together and integrating them is very important. If you cannot integrate Emojics to your CRM tool or autoresponder, you won’t be able to send targeted emails to your customers. Integrating apps, tools, and software is challenging and that’s where Zapier comes for rescue. It helps you connect apps and automate workflow. 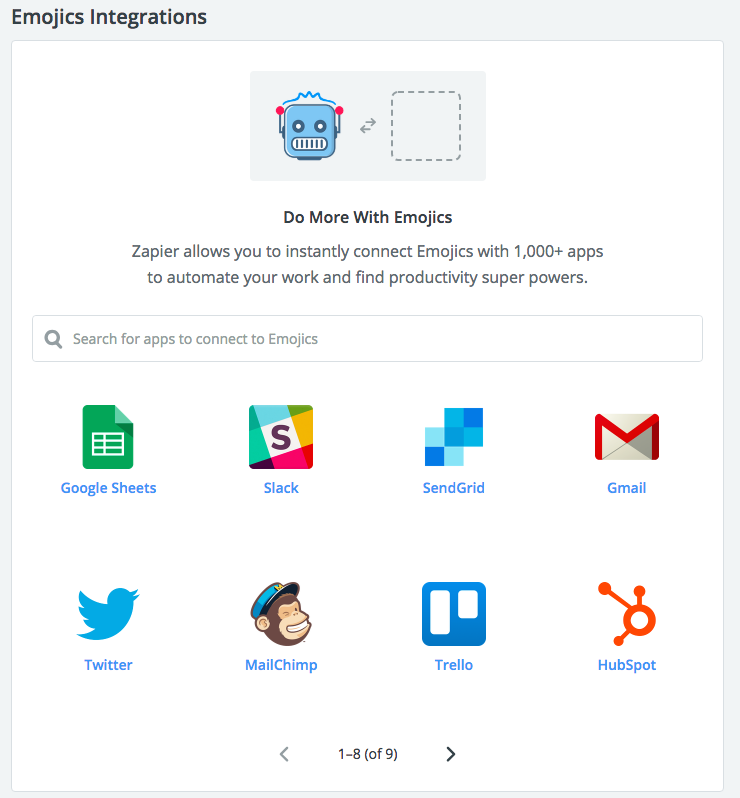 Here is the good news: Emojics works with Zapier and you can connect Emojics to thousands of other apps via Zapier. This means you can use data from your Emojics account and send it to any other app. I’ll show you how you can do it in this post but before moving to the nitty-gritty, let me give you a quick overview of Zapier and how it works. Zapier lets you automate your workflows and lets you connect web apps so that they work automatically without any supervision. Working with Zapier is simple: You just have to connect your apps and choose a suitable trigger, and that’s it. In order to understand how Zapier works, you’d need to understand a few terms. A Zap is a workflow that will execute automatically over and over again. You can choose an existing Zap from Emojics integration here or you can create your own Zap connecting Emojics to hundreds and hundreds of different apps. A zap consists of a trigger and an action. Triggers: A trigger will start the workflow in the zap, for instance, you want to send an email to new leads from Emojics via SendGrid, a new lead is a trigger. Whenever a new lead will be generated, it will trigger your zap and it will kick start. Action: What happens when the trigger occurs is the action. In other words, what action you want your zap to take when a trigger kicks in. For instance, you want to send an email to Emojics leads, in this case, send an email is the action in your zap. So a Zap consists of a trigger that initiates an action and this happens automatically at the backend without you having to even look at it. Your zap will run every time a trigger will occur and that’s how you can benefit from Emojics integration. 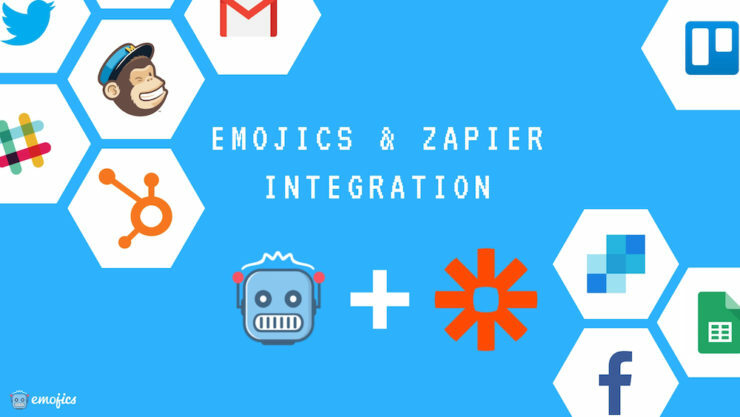 To give you an idea of the power of Emojics integration with Zapier and other apps and how these automated workflows (aka Zaps) can grow your business, below is the list of 4 of my favorite Zaps that are must-have for every business. It is a perfect Zap for businesses that use Trello for team collaboration. It integrates Trello with Emojics comments. Whenever you get a new comment on Emojics, a new card on Trello will be created. This will help you respond and monitor to customer comments, feedback, or even complaints via Trello. For instance, if you’re using Emojics to collect feedback from website visitors. This Zap can be really helpful. It will create a new Trello card for every feedback and your team can handle the rest. How about taking your lead generation to a new level automatically? Use this Zap that integrates Emojics to MailChimp. Here is what it does. Whenever a new lead is generated in Emojics via your Emojics lead generation campaign, the email address will be added to a list in your MailChimp. You can set up a campaign for your list and send emails to all the new leads. This means as soon as you generate a new lead via Emojics, MailChimp will initiate the campaign and the subscriber will start getting relevant emails. It is all automatic. You can choose what emails to send, when to send, and so on. You can nurture leads the way you like. If you use HubSpot to manage contacts, this is the Zap for you. It triggers when a new lead is generated in your Emojics lead email campaign and Zapier will add the contact in HubSpot or update an existing contact in HubSpot. If you’re using HubSpot CRM or marketing, this Zap can help you nurture leads and engage with your leads and customers. It can prove to be a game-changer. This Zap helps you collect and manage data from Emojics and is especially useful when you’re using Emojics to collect user feedback via emojis. Whenever a new reaction is created in your Emojics feedback campaign, Zapier will create a new row in a Google Sheet of your choice with reaction details (Location, page, etc). This will help you transfer all the data from a feedback campaign to Google Sheets automatically which will make analysis a piece of cake. You can use the sheet in your Analytics tool or any other tool for further analysis or reporting. Now all your feedback campaigns are fully automated. We have created a lot of zaps for you, you can find them here. Choose the zap you like and get started right away. You can create your own zaps by integrating Emojics with your favorite apps. Here is a tutorial on how you can create a Zap as per your need. There are no limitations whatsoever. Emojics integrations isn’t an issue anymore. You can use Emojics with any app you can think of. Zapier only lets you connect Emojics with other apps and automate workflows. What’s really important is what you have to automate and how you have to use Emojics to boost engagement and generate more leads. You need to have an understanding of what you should automate and why you have to automate it. The way how you use Zapier and Emojics together to automate and grow your business is the key.